Designing and implementing the current Logo in all previous media as well as promotional and informational sheets and flyers; User Handbook for the top products and assembly schemes and visual information and control schemes for the newest products. Digital sketching of graphics for the engineering team in order to facilitate the development of the newest products. Designing promotional and informational sheets and flyers as well as practical equipment for the technical team. The Graphic Design graduated student will be able to explore new paradigms of visual communication, adopting an interventionist approach to the level of new communication technologies. has learned the theoretic basis needed to endure any sort of design project. developed even further his knowledge of the Adobe Creative Suite software in ways to suit any sort of media required. developed several design projects simulations with the same amount of rigour and hard work they would require if they were real. Portuguese / English Portuguese is my native language and I have equal easiness either with native Portuguese or Brazilian Portuguese. I am proficient in English to an almost native level. I am always willing to learn new skills. If reviewing my job application don't disqualify me because I lack a certain skill, I'll learn it, I wouldn't apply for the job if I didn't thought I could learn it, in fact there's a high chance I am doing some tutorials on that skill right now! I am not a sound expert, I am however self taught in Adobe Sound Booth and use it to backup movies I edit in other software. I learned Adobe After Effects CS3 while in University, since then I have been keeping up to date to the CS5 version. I learned Adobe Premiere CS3 while in University, since then I have been keeping up to date to the CS5 version. I learned Adobe InDesign CS3 while in University, since then I have been keeping up to date to the CS5 version. I learned Adobe Illustrator CS3 while in University, since then I have been keeping up to date to the CS5 version. I learned Adobe Photoshop CS3 while in University, since then I have been keeping up to date to the CS5 version. I got my first computer at the age of 14, at that time one of the things that I found more entertaining on the internet were flash animations. I became self taught in flash to the point that when I was studying it years later in University I was more skillful than my teachers. I enjoy a huge variety of media, from movies to series, anime, cartoons etc. 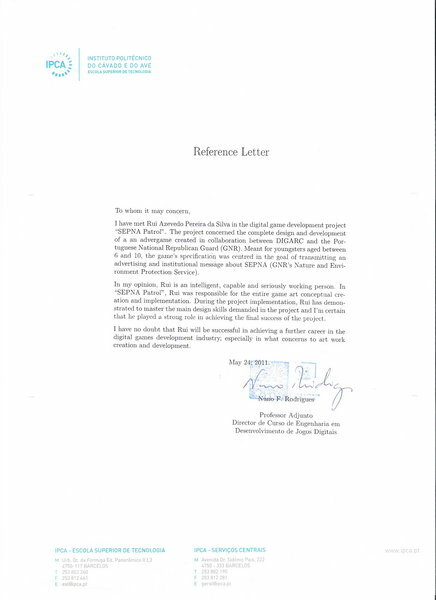 I have contributed to a collaboration with the Engineering In Development OF Digital Games Degree in IPCA during my final year, as an extra curricular project, I attach recommendation letter from the responsible teacher to this CV. Rui Silva is a young and passionate bilingual (English/Portuguese) artist, designer and gamer. He’s currently looking for a job in any field of work. He’s a dependable and responsable person with an easy going personality and a great team worker. I have entered the Portuguese national Tekken 4 tournament, live on national TV in 2003 and was ranked one of the 8 best players.